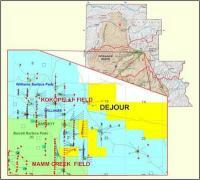 Dejour Energy Inc.updates current development progress underway at the Kokopelli Project ('Kokopelli'). The Frontier-28 rig has completed drilling and casing the water disposal well on Pad 21A, vital to the economics of the ongoing Kokopelli production programs. The rig has now been moved to Pad 21B, less than 500 yards away, where it has successfully spud the Federal 14-15-1-21 well (a Williams Fork test with a projected depth of ~8500'), the first of eight new production wells to be drilled, logged and cased sequentially prior to fracking, completion and tie-in operations to our contracted gathering facilities. 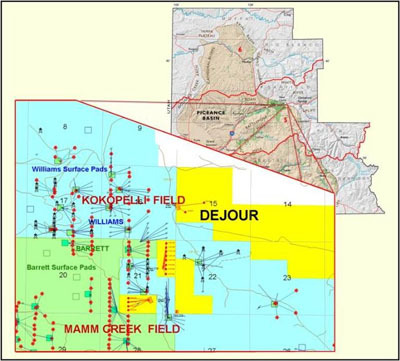 Dejour owns a 25% working interest in the Kokopelli Project and is carried for 25% of the first US$16 million in expenditures. To date the program is on time and on budget. Additional information will be provided as available.